Ain’t No Laughing Matter is one of my favourite tunes written by my friend, the late Wayne Sorge. Here’s my official version, from my CD Unassumed Sideroads. I’ve had so many requests for the lyrics for this that I’ve added them to the video, over a slideshow of run down or abandoned buildings in Virginia and South Carolina. The photos were taken by my Friend Joan in Charlottesville – thanks Joan! Please have a gander and tell me what you think. Don’t know about you, but I need to party this winter into a distant memory. There are just too many people I didn’t get to see being cooped up in the cold and ice. So on the 28th – remedies shall be had! I want to see your mugs and say hello, and help you wash this winter right out of your boots. 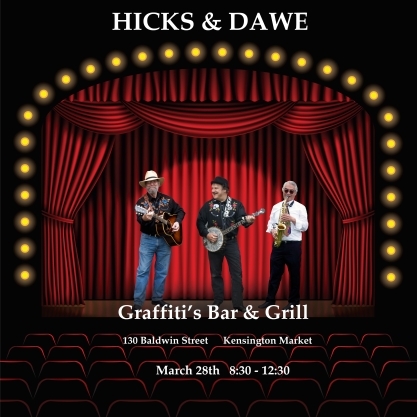 Friday the 28th, at 8:30 after dinner, we will be rocking the roof down at Graffiti’s. We’ve worked up some killer sets, including the legendary one what had ’em pounding the floor at the Old Nick in February. Me, Doc on The Gibson, Neil on sax and bass, and Martha holding down some beats with various percussive mechanicals. 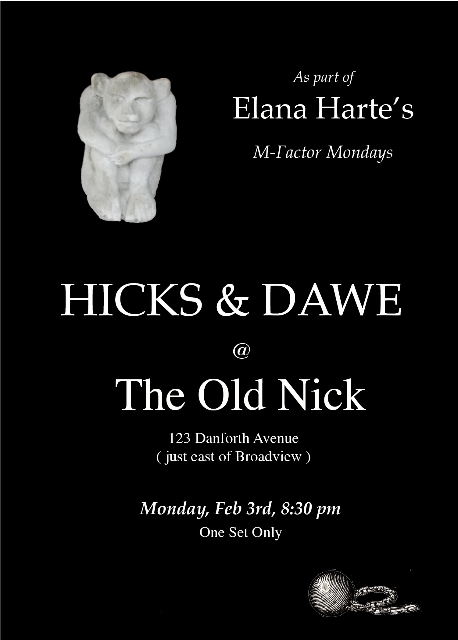 On Monday February 3rd, We have been honoured to be invited back to do a set at Elana Harte’s M-Factor Mondays at the Old Nick. With one set, we’ve compressed a whole night’s worth of goodness into a dozen tunes that will literally blow you away. Elana is kicking it off with some of her excellent rock, and we’ll be trading sets with Bri-Anne Swan after that. Come early and have a pint while we’re watching Elana. Hicks on banjos, Dawe on guitar, Kitagawa on sax and bass. No cover. To celebrate New Year’s on the Orthodox calendar, we’ve lined up some special tunes for you. In our own orthodox way, we’ll be playing almost exclusively our own neo-roots material. Our own way, as always. It will be a warm, cozy night to get away from the frigid howling mess that Toronto has become, and time to raise a pint to spring. You know, the more you come out and have fun, the sooner spring will come. Scientific fact. Me on banjo, Doc on guitar, and Neil on sax and bass. 3 sets – starting at 9, done by midnight. 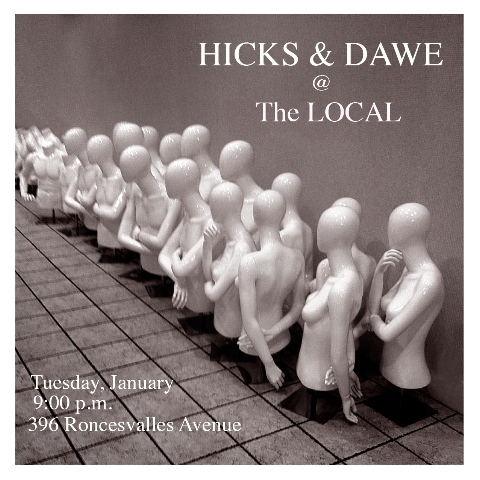 Hope to see you.